Really, what is she doing combining bulgogi beef and noodles? Well, effectively bulgogi is just a marinade and I love marinated beef. It then makes for a really yummy noodle dish when you pump it up with veggies and noodles. It’s the perfect noodle dish for kids too, as the flavours aren’t too overpowering or too spicy. 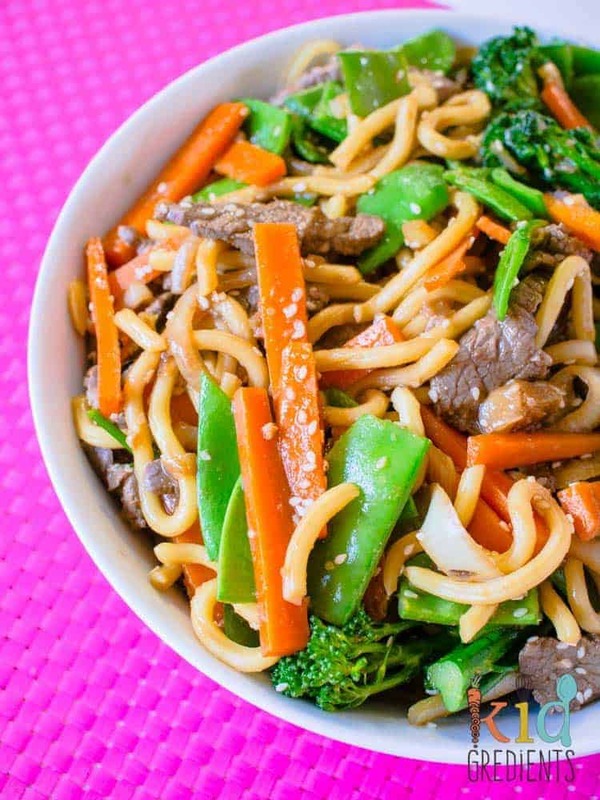 This bulgogi style beef with noodles and veggies is the perfect summer meal. Seriously, find me a kid that doesn’t love noodles, and at least with these you know that you’re getting veggies in with the noodles, which is definitely a plus! 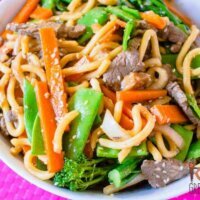 The secret to these noodles is the super cheap sizzle steak that you use and the marinating that makes it soft and tender unlike the strips usually used in stirfries and noodle dishes. I really think those beef strips are not at all good for quick cooking. 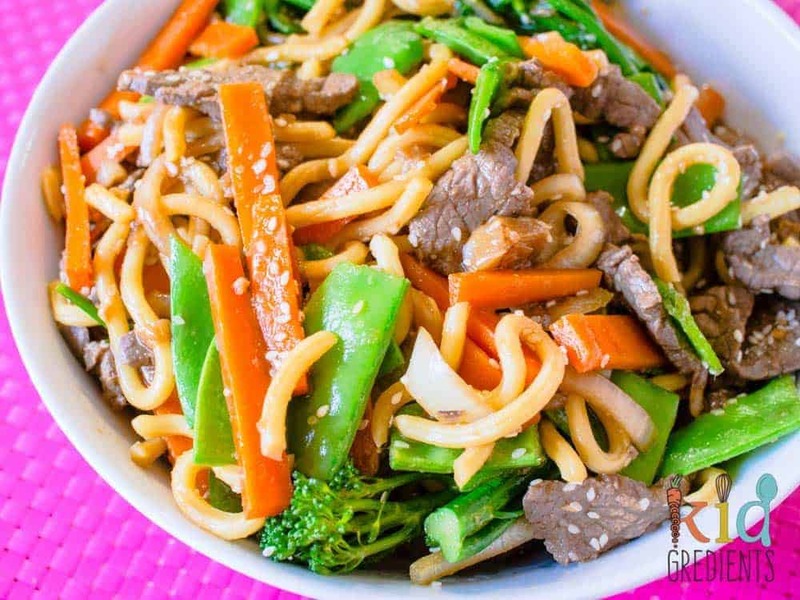 If you don’t believe that sizzle steak can get you an awesome noodle stirfry, then I beg you…try it this once, then judge away! Maybe you’re looking at this dish and thinking “my kids won’t eat those veggies”? Well if that’s the case, sub them with ones they will eat, like baby corn, green beans, whatever tickles their fancy, as this really is a versatile dish. You need at least an hour to marinate the sizzle steak, as the marinating means that the steak is tenderised and the sinew in the meat is broken down. With only 400 grams of sizzle steak used in the recipe, it’s quite a cheap meal, and you can customise your veggies to be what’s in season. Even the fussiest eater is catered for with this Bulgogi style beef with noodles and veggies. This one pan meal could become your new weekday go-to! 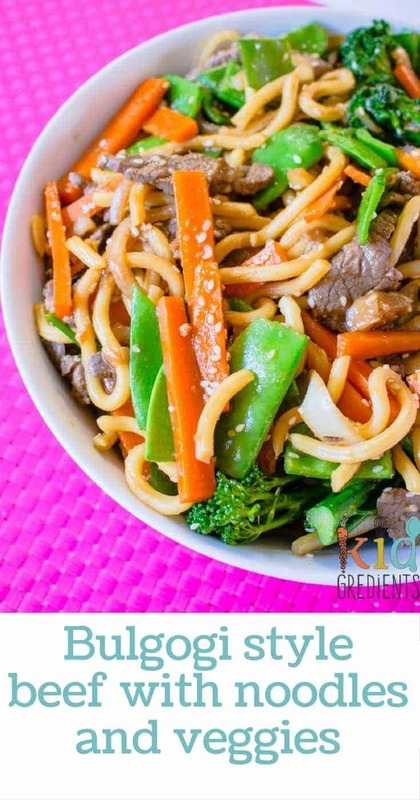 This Bulgogi style beef with noodles and veggies are sure to please even the fussiest eater. This one pot, easy to make recipe is super versatile too, switch the veggies to suit what's in season and you've got a yummy, budget meal the whole family can enjoy! 150 grams snow peas, topped and tailed and halved. Combine the sesame seeds, sesame oil, soy sauce, garlic, ginger and raw sugar in a jug and mix well. Pour over the beef and refrigerate for at least an hour to marinate. Heat the peanut oil over high heat in a wok and fry the onion until soft. Add the carrots and cook for 4 minutes. Add the beef , reserving the marinade. Cook quickly until the beef is brown, then add the noodles to the wok and the reserved marinade. Cook for 5 minutes or until the noodles are softened. Add the broccolini and snow peas to the wok and cook for 4 minutes more. This is best served fresh, I don't recommend freezing hokkien noodles. However it is still yummy the next day as lunch! This sounds delicious ? 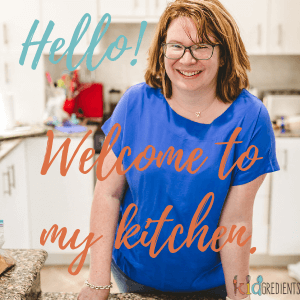 I love a simple stir fry + kids always love a noodle dish ?? Thanks Jennifer! Noodles make everything so much more fun!